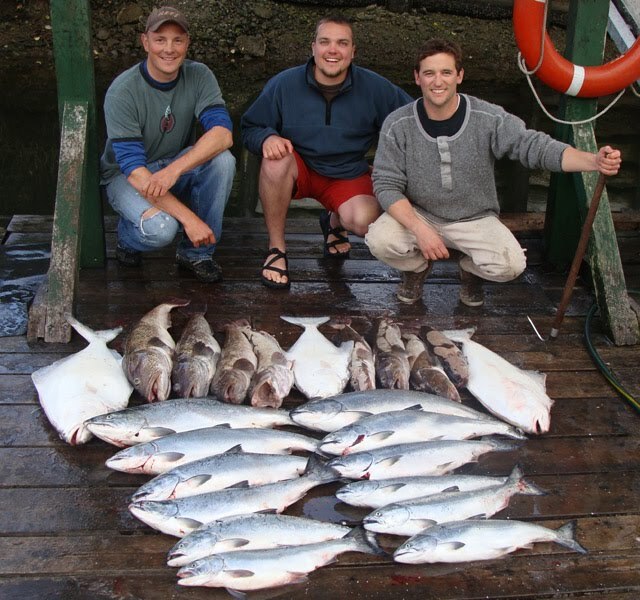 Jolly Rogers Fishing Charters reports another fun day's fishing in San Juan Harbour and out at Swiftsure Bank. Each day is different offshore...lately it has been huge schools of coho and lots of halibut...this day it was lots of big ling cod and feeder spring salmon. Lots of fun, either way. The coho are stacked up in front of the San Juan rivermouth, and there is lots of fun to be had trolling shallow or casting from the boat. They are jumping all over the place, and hooking into a 20 pounder right at the surface is as good as salmon fishing gets! For the next few weeks, as more and more coho arrive, Port Renfrew will offer some of the best salmon fishing on Vancouver Island. Check out Port Renfrew Marina's coho derby on Oct 3 and 4. $25 to enter, with $5 to salmon enhancement and the rest to the winner....with the great fishing drawing more people in, this year's purse will probably top $10,000. Good times to be had in Port Renfrew!